I’ll start off by saying that this is not the type of board I normally ride, so for me it kind of sucked, but I’m going to review this board based on what it was meant for by the shaper. I’m a small lightweight guy that prefers high performance shortboards. 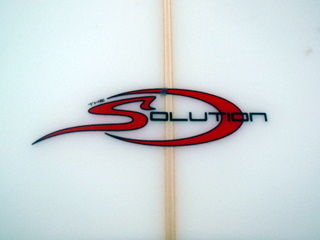 The Solution by Stewart Surfboards does not fit that category at all. This board is my dad’s and he got it because he wanted a board that paddled really well, got him into waves early and with less effort than a typical shortboard, but that still provided some shortboard maneuverability. Based on what he wanted, I think he got a pretty good board. We switched boards while surfing a San Clemente beach break last week and his board performed perfectly according to what it was meant for. It was amazing to me how easily this board got me into waves. I was shocked by how much effort I had to put into catching waves once we switched back. Not that I am sold on switching to this board, because once I got up it definitely did not perform like the Lost Shark that I was riding that day. But for an older guy who needs surfing to become a little easier, the Stewart Solution is a surfboard that is a perfect mix of a longboard and a shortboard. The board is 6 feet long, 18 inches wide, and 2 ½ inches thick. The board is a little thicker and wider closer to the nose than standard thrusters, while the tail is more brought in, to a more narrow diamond tail. I loved how easy the board got into waves, but once up, all that foam up front made the board react slowly while trying to dig in on hard turns. It seemed front heavy to me, but surprisingly was still pretty maneuverable. 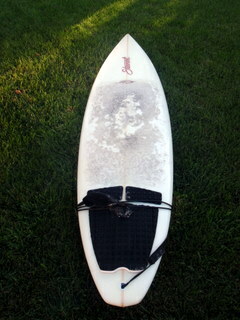 I used the board another time at trestles where it was very well suited to that kind of wave. The board kept a lot of speed even when the wave got kind of mushy. Like I said, I’m not going to start riding this board everyday, but I did have a very fun time doing long, drawn-out “old guy” turns on the Stewart Solution.